Status: The Persian squirrel is scarce in Lebanon and is extremely wary of any human presence. Description: Persian squirrels are quite similar in size (head and body measure approximately 20 cm) and appearance to the European Red Squirrel Sciurus vulgaris, but they do not grow ear tufts during the winter months as the European Red Squirrel does. They have flattened, bushy tails and generally their fur is reddish brown on the back and buff-white on the belly, although this seems to vary by region. Habitat: This species can be found in both the mixed deciduous woodlands and the pine woodland habitats. Habits: Persian Squirrels are mostly active during the day. 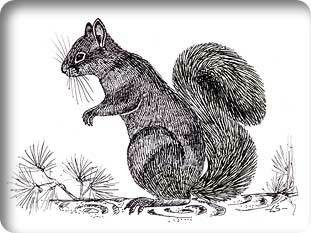 They feed on cedar and pine seeds and the acorns of oaks trees, but may occasionally feed on birds and their eggs. Like other squirrels, they hoard seeds and acorns for the winter months, but they spend more time on the ground than other arboreal squirrels. Persian Squirrels breed throughout the spring and summer, with a litter size of about three. Nests are built in trees and made of moss and dry leaves. Distribution: The Persian Squirrel is widespread throughout Asia Minor, northern Arabia, Transcaucasia, western Iran and the eastern Mediterranean region.